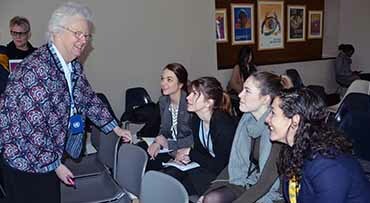 Sister Eileen Reilly talks to students (from left) Maggie Meystrik, Joey Wagner, Maddie Tewey and Elena Bernassi before the start of one of the sessions. 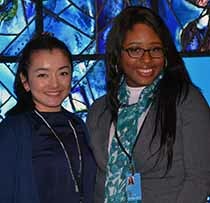 Academy of the Holy Angels students Jaya Sharma and Arianne Rowe outside the U.N. Chapel. In Friday’s U.N. Commission on the Status of Women session on “Closing the Gender Gap in Entertainment,” the diverse panel included an actor, author, cartoon animator, psychologist, teen magazine editor, clothing designer, United Nations advocate and an organizer from the Women’s March on Washington. Their stories and experiences joined together to bring forward a message that the students in the School Sisters of Notre Dame delegation took to heart – that they need to find the voices that are not being heard and that they must not be afraid to be the heroes who make a difference in the world. Teen Vogue Editor Lauren Duca said that young people often are treated as if they are separate from polities. She recalled that her high school government textbook said that young people are not interested because they cannot have an impact. Carmen Perez, one of the organizers of the Women’s March on Washington, shared that she has dedicated her life to ensuring that women find pathways to get involved in their communities and to love themselves for who they are. “I try to teach young women that they can bring their whole self,” Perez said. That message had a profound affect on Elena Benassi, a student at Notre Dame Preparatory School in Towson, Maryland. Although Arianne Rowe, a student from the Academy of the Holy Angels in Demarest, New Jersey, attended a different session, those speakers left her with the same resolve. She had been considering going into politics but was hesitant because she wasn’t sure if she’d be able to have any impact.